In order to comply with Required Agricultural Practices (R.A.P. ), the state guidelines for small farms, Guy Crosby enrolled in a Nutrient Management Plan offered by the UVM Extension and NRCS in January, 2016. It was a comprehensive course that inventoried all the fields for soil type, fertility, and environmental impact. It has proved to be valuable in increasing crop yields. The course could have been named nitrogen management as this was the main takeaway. Commercial nitrogen fertilizer consumes a huge amount of energy to produce, and farm-based nitrogen is highly volatile. Instead of topdressing gutter manure from a nearby dairy in the middle of a hot summer day, where the nitrogen evaporates quickly, at Clay Hill Farm we stock pile it and spread manure in the fall. Guy uses a tow-behind aerator before spreading, and drags the field afterwards to incorporate the manure into the soil. After chopping the corn in the fall, he uses a three shank ripper to further reduce compaction and aerate the soil, then seed winter rye as a cover crop to lessen erosion and replenish lost nitrogen. By increasing the clover population in a given field from 20% to 40%, the need for nitrogen fertilizer is reduced significantly. By incorporating these protocols, Guy was able to get a fourth cut of hay off one field that tested 20.4 in crude protein with a 66 TDN. 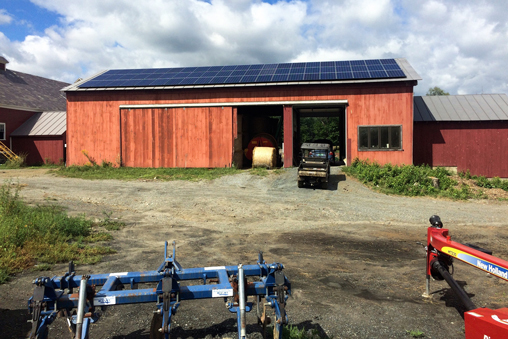 With the addition of 63 Canadian Solar modules mounted on one of the barns in June 2016, Clay Hill Farm produces enough electricity to meet its needs.